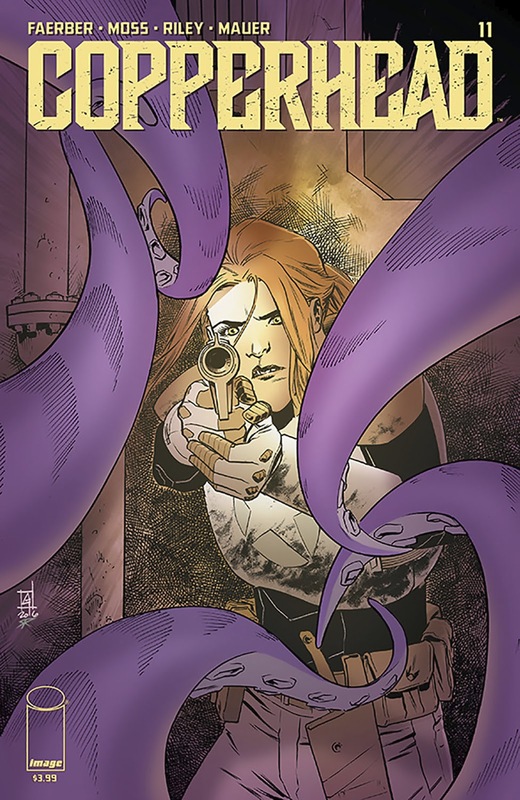 Back from hiatus, 'Copperhead' #11 picks up where it left off. The mayor is dead and suspects begin to mount. Sheriff Clara Bronson is back in one of the coolest sci-fi westerns in comics as creator Jay Faerber welcomes new artist Drew Moss to the series and doesn't lose a beat. This new arc is accessible enough even if new readers don't know the background. Clara became the new sheriff of Copperhead leaving behind a mysterious past on another planet. That past is slowly coming around to rear its ugly head. Meanwhile, her new position created a giant disgruntled deputy nicknamed Boo who felt he was passed over and her son befriended an android. It's just your typical day in Copperhead. There's plenty of intrigue with this latest murder mystery and someone is trying to undermine Clara's authority. She remains one of the strongest female characters in comics - tough, no-nonsense, determined. In those rare times when she lets down her defenses, she's human and vulnerable revealing she's being not only strong for herself but for her son as well. She's worth cheering for despite her prickly exterior. The contrast against the more affable if not disgruntled Boo helps to balance out the dynamics of the series. Taking over for original series artist Scott Godlewski, Moss demonstrates a similar art style - sharp lines, great character designs, and energetic well-paced layouts. Just like any new artist on an established series, it takes a moment to get used to it but there really isn't a drop off in quality. What has remained is the wonderfully vibrant color work of Ron Riley. He's helped make 'Copperhead' look unlike anything else in comics. 'Copperhead' is back with a new mystery to solve. Clara and Boo are back in this great sci-fi western with engaging characters and a twisty plot. Catch up if you can with the series but if not issue eleven won't disappoint in hooking you into another immersive story.